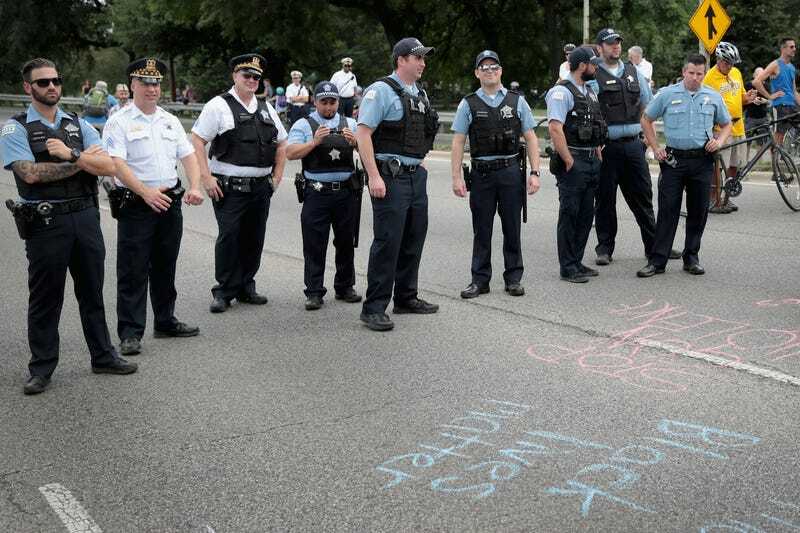 Police stand guard as demonstrators protest on Lakes Shore Drive on August 2, 2018 in Chicago, Illinois. The demonstrators, who marched from Lake Shore Drive and through the nearby neighborhoods to Wrigley Field were protesting the ongoing violence, corruption and the lack of economic investments in African-American communities on the city’s west and south sides. According to the Chicago Tribune, the decision was made after a deal was introduced between Mayor Rahm Emanuel’s administration and Illinois Attorney General Lisa Madigan’s office on Thursday. The changes are expected to take place by July 2019. Officers will not be required to fill out a use of force report as if they had deployed their Taser or fired their weapons, but supervisors will have to review the incident and it will be recorded in city data, the report notes. The police department will also be required to develop a training on when it’s appropriate to point a weapon. The issue of tracking gun-pointing incidents was a late sticking point between Madigan and Emanuel in the push to bring federal judicial oversight to the department, a process sparked nearly three years ago by video of an officer shooting teenager Laquan McDonald 16 times. Lawyers for the two officials have been working toward a consent decree—a court order enforceable by a federal judge—intended to tighten the rules on uses of force and strengthen supervision and discipline, among other changes. Attorneys working with activist groups on the consent decree litigation have described the deal as a step in the right direction but still, have questions about how accessible and/or complete the data would be. Meanwhile, police officials have argued that such a requirement could make cops hesitate in potentially dangerous situations. Nonetheless, Madigan is emphasizing that, “There’s nothing in the draft consent decree … that prevents an officer from defending themselves,” while also stressing that pointing a gun at someone is a “very serious situation” that requires documentation to make sure officers are using their guns properly. Currently, lawyers representing Emanuel and Madigan are writing up a new draft of the proposal which will be submitted to District Judge Robert Dow Jr. Once that draft is filed, Dow is expected to take written comments and hold hearings in October on what the final decree will include. The court agreement would mark be one of the most significant consequences of 17-year-old Laquan McDonald’s death at the hand of Officer Jason Van Dyke, who is currently on trial for first-degree murder.